Ok, I would like to plot this data and, as it is easy to notice, without some manipulations with scale this picture will be not informative. I tried to combine ListLogPlot and take Abs from negative values of my data, but, unfortunately, the attempts failed. 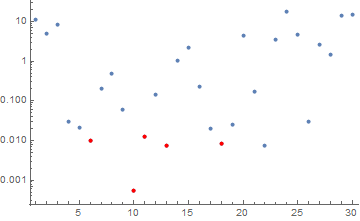 How can I do Log scale on the positive part of Y-axis and usual(without scale transformations) scale on the negative part of Y-axis? not exactly what you asked for , but one way to present such data is a log plot of absolute value, color coding the negatives..
Why is ListLogPlot skipping entire decades? 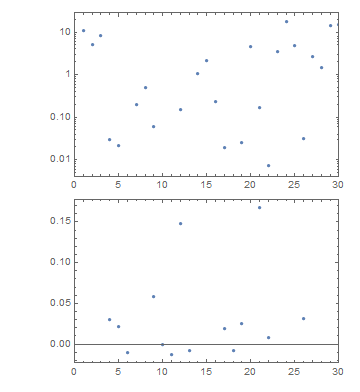 How do I change the scale on a plot so different parts of the axis are on different scales?